Clutching the moonman for Video of the Year at last year's MTV Video Music Awards, there was just one person Camila Cabello wanted to share the moment with: her 15-year-old self. Six years earlier, she had been feeling out her place in Fifth Harmony, a newly formed girl group just trying to outshine the collection of other acts on The X Factor, and desperate to set foot on the famed award show's pink carpet. "I wanna be there SOOOOOOO bad you don't understand," she tweeted, "#someday." So when no less than Madonna handed her the night's top trophy, it was a complete out of body experience. "YOURE NOT GONNA BELIEVE THIS SMOL CAMILA," she responded to her old missive, "BUT: IN 2018 MADONNA IS GOING TO GIVE YOU AN AWARD FOR VIDEO OF THE YEAR AND YOUR ACNE WILL CLEAR." While she was certainly grateful the HD cameras were capturing a smoother visage, it was the whole pop legend honoring her bit that left her hands shaking. "Madonna, I love you so, so much. I've seen every single music video of yours. I've seen every single documentary of yours," she said in her acceptance speech. "You've inspired me so much, and for that reason, this is a surreal moment. And, I love you, seriously. I can't believe it." And if she thought that was great, well, she should have seen herself open up this year's Grammy awards in an impressive performance that featured the likes of J Balvin, Ricky Martin, Young Thug and Arturo Sandoval. She was also up for two awards for Best Pop Vocal Album and Best Pop Solo Performance, only losing out to Ariana Grande and Lady Gaga, respectively. Not too shabby. Credit the impossibly catchy ear worm that is "Havana", the lead single off the debut, self-titled solo album she launched last January. While Camila certainly held its own, debuting at the top of the Billboard 200 before going platinum, "Havana", her track featuring Young Thug, hit No. 1 on the Hot 100 in January and is still being streamed some 9 million times per week. With a cool 1 billion streams on Spotify, it's the service's most-played track by a solo female artist and you're probably humming it to yourself right now. You're not alone, of course, shortly after its August 2017 release, President Barack Obama named it one of his favorite songs of the year. "I cried," Cabello recalled to Billboard. "I made a video of myself crying!" Perhaps that was the moment the singer, just 22-years-old today, knew she had been right to risk the established notoriety of Fifth Harmony on the dream of going solo. Or it could have been while she was juggling her headlining world tour with a spot opening for Taylor Swift. Or, possibly, as she was collecting four American Music Awards, two VMAs, a Billboard Music Award for Chart Achievement and a leading four trophies at the MTV European Music Awards. Safe to say she has few regrets about leaving Ally Brooke, Normani Kordei, Dinah Jane and Lauren Jauregui behind back in December 2016—save for the drama that followed as the two sides released conflicting statements about how her exit went down. As one fifth of a girl group manufactured by Simon Cowell during their 2012 reality show run (the quintet, named through an audience vote ultimately finished third) the teen had little say in the direction of her career. Now she has an album full of songs that reflect her personality and Cuban roots and resonate with her growing audience. "Getting to do shows where people are singing words that I wrote back to me was a completely mind-boggling new experience," she told Billboard. "The last year was definitely the best year of my life." And it all began with Camila. Originally slated to be titled The Hurting. The Healing. The Loving., "I decided to call it by my name, because this is where this chapter in my life ended," she shared on Instagram. "it started with somebody else's story, it ended with me finding my way back to myself." That person is the same young girl so crippled with stage fright that she turned down a chance to star in her middle school musical because she was terrified at the thought of singing in front of people she knew. She could kill a Britney Spears or Hilary Duff song if she was on the phone with a friend or belting it out through a closet door as her grandmother listened on the other side, but having to stare directly at a familiar face? Forget it. She came alive during The X Factor process, convincing her parents to spend the money they would have used for a quinceañera to drive the family to the North Carolina audition. "There's way less risk performing or exposing yourself to strangers than there is in your own town or school," she explained to Marie Claire last year. "On The X Factor, I kind of became the person that I wanted to be. In interviews, I was super goofy and confident. I look at videos of myself from the first performance, and I'm winking and pointing. I was dying inside—literally, my hands were shaky, my voice would be flat allover—but I was like, I just have to just go for it." The female answer to One Direction brought her instant notoriety, with songs on the Billboard Hot 100 and a 69-city tour, but soon Cabello felt trapped, just one cog in a massive wheel. "I would try to kind of rebel in my own way and wear turtlenecks or pants—which was allowed. Nobody ever put a gun to my head and was like, 'You have to do this.' But it was definitely moving in a certain direction and there was a group mentality, so you have to do it." So she tested the waters, collaborating with Shawn Mendes on their 2015 hit "I Know What You Did Last Summer" and Machine Gun Kelly on 2017's "Bad Things", and quietly holed herself up in hotel bathrooms writing out lyrics for the types of songs she'd love to sing. Getting the chance to actually bring those words to life, was an immense relief, she shared with Cosmopolitan UK. "I loved making all the decisions, because the product was something that was fully representative of me. It's like making your own coffee or breakfast. It tastes better because it's yours, because you made it. That's what it felt like for me." That's not to say everything magically clicked into place when she revealed her intentions to go solo. In addition to the ensuing Fifth Harmony drama, she still had to fight to have herself heard in meetings with execs. "Havana" in particular was a labor of love. After working on the tune for five months, she was still struggling when Pharrell Williams reached out to her producer Frank Dukes and said he was interested in working with her. "It was my birthday, and I was like, 'We have a chorus for this song, but I can't figure out the rest,' and he just came up with the melody for the verse we needed on the spot," she told Marie Claire. The song was finished by close of day, but then she had to keep working to convince her label it could be a hit. "They were like, 'You have to make it faster. You have to add production. Radio isn't going to get it. It's a cool song, but it's not your single.'" A pep talk from Swift, whom Cabello befriended after having the guts to approach her and Lorde at the 2015 MTV VMAs, convinced her to keep fighting. 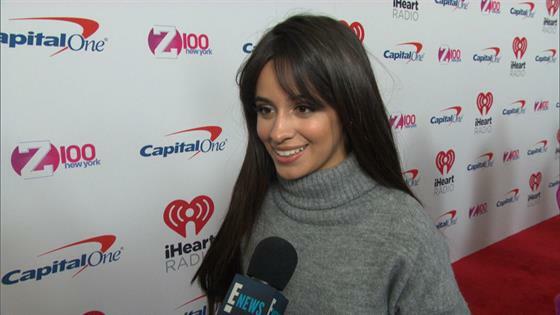 "She was like, 'People on the outside are never going to think about the story that you want to leave behind,'" Cabello recalled. "'That's yours, so you have to always protect that, because to other people it's a song, but for you it's something personal.'" Its unstoppable win streak no doubt feels validating, but Cabello isn't taking an I told you so victory lap. "I'm never going to be like, 'This is a huge song.' But I really liked it, and that's what matters." Nor is she gloating about the success she's experienced since leaving her girl group days behind. When Video Music Awards host Tiffany Haddish mentioned her five nominations, joking, "So for those of you watching at home, 'Hi Fifth Harmony,'" Cabello responded with a vigorous head shake. And she put forth the effort to make nice when she spotted former bandmate Kordei at the Billboard Music Awards. "We kind of mutually came up to each other. She'd performed that night, and so I was like, 'Oh, how was it?' She said, 'Oh, I was so nervous.' And I was like, 'By next year you'll be totally fine. You're killing it. I'm so happy for you. I'm so excited to see what you do with your music.'" Fifth Harmony has since put their collaborative efforts on pause, allowing the remaining members to also explore that solo life and Cabello couldn't be more pleased. "I told her, 'I just want you to know, I really hope we can all move on from everything, and I'm genuinely happy for the other girls, and I hope you tell them I wish you the best,'" she told Marie Claire of her chat with Kordei. "And she was like, 'I'm so proud of you.' It felt like everything is totally fine." Really, everything is freaking fantastic in Cabello's world, with a steady romance providing the cherry on top of her unbelievable year. She met British relationship coach Matthew Hussey when they both appeared on NBC's Today in September 2017. By the next February, they were photographed taking their love to a Mexican beach. Cabello is still coming to grips with the celebrity aspect of her thriving career, the sharp uptick in her level of fame that makes people care about who she's kissing in the Mexican sand or a Santiago, Chile airport. She does her best to appear inconspicuous in public, like the time she donned a mask to take her 10-year-old sister Sofia trick-or-treating at home in Miami. "I can't spend an hour in hair and makeup every day," she explained to Billboard. "Some people will do that because you get photographed walking around in the street, but I just can't, you know?" As for Hussey, 31, she's willing to share how well they fit together. "He's so similar to me," she told Marie Claire. "In person, we're just weird and silly and stupid together. He makes me the happiest I've ever been in my life." She realizes she could be better at the game, but is also comfortable with the fact that she's not. "I know that it would be a lot more interesting for people if I posted more about my private life or was involved in the gossip or whatever," she admitted. "I just don't like it. I just want to be a good artist. I don't want to be a celebrity. I'm not!" We're going to have to respectfully disagree on that front, but can appreciate a desire to let her work speak for itself. If she's trying to avoid a place in the tabloid circuit, she's doing all the right things. Not one for partying or going to the clubs, she marked her 21st birthday last March by with cake and balloons beside her family at home in Miami. And up until recently she shared a lavender-and-pink bedroom there with her little sister that was covered in Mickey Mouse paraphernalia, a nod towards her childhood desire to be a Disney star. This despite the fact that when she fled to Miami from Cuba at age six (her architect mom selling shoes at Marshalls to make ends meet; her dad washing cars in front of a mall) she knew precisely no English. The Florida city is still very much home. When Cabello purchased a house there last year (complete with a pool, which felt like the ultimate indulgence), it was for both herself and her family to live in. "Every time I come here, I feel more in touch with everything that my family had to go through for me," she shared in her Made in Miami Artist Spotlight Story, a 2018 collaboration with YouTube. "It's just that sense of being humbled by where you come from, and also the food here is awesome." After her big night at the EMAs last November, the self-described introvert returned back to her Bilbao, Spain hotel room with her date—mom Sinhue Estrabao—and prepped for their morning flight to Miami. Despite being on her grind since the age of 15, she still feels like a bit of a newcomer, explaining her five years in Fifth Harmony don't necessarily count toward her pop star street cred. "I really have just been a solo artist for a year, so I can't take an extended break....I don't feel like I should do that, you know?" she reasoned to Billboard of hurrying home to work on her forthcoming second album. "I think that there will be a time where I want to take a few months to go live in Spain or in Italy and just pig out and just not have any discipline or any responsibility. But I feel like I haven't really earned that yet." What she does feel is her right, is being choosy about which work she takes on. Brushing off rumors she was set to star in Steven Spielberg's upcoming West Side Story remake, she told Marie Claire, "I don't think so. I feel like this has been the first year and a half of me getting to know myself. I have this confidence now that I haven't had before, of listening to myself and not really doing brain damage on 'Should I release this song?' 'Should I do this this way, or should I do it that way?' 'Am I the way this person sees me, or am I the way I see myself?'"